Sales of the GMC Sierra increased 49 percent to 16,582 in July, and sales of the Chevrolet Silverado climbed 45 percent to 42,080. GM said it has 140,035 of the full-sized pickups in inventory, a 68-day supply. General Motors' U.S. sales rose 16 percent in July to 234,071 units, as full-sized pickup deliveries jumped 44 percent and all four of the automaker's brands posted double-digit increases, the company said today. Retail sales of GM vehicles rose 23 percent from July 2012, while fleet sales fell 6 percent. Fleet sales accounted for 19 percent of GM sales in July. "For GM, July was the most well-balanced month of the year from a retail sales standpoint: Trucks were hot, but so were small cars and family vehicles," Kurt McNeil, vice president of U.S. sales operations, said on a conference call with analysts and reporters. "Our experience shows that the difference between good sales and great sales in a slow-growth economy is how many new products you have to offer, and we are starting to hit our sweet spot." Chevrolet sales jumped 17 percent to 162,670 units. Cadillac sales also rose 17 percent, to 15,652. GMC sales rose 14 percent to 39,356, and Buick sales climbed 14 percent to 16,393. GM said its total inventory is 638,517 units, a 68-day supply. McNeil estimated the company's market share in the mid-17 percent range. Its share was 18.2 percent for the first half of the year, according to the Automotive News Data Center. "We think there's definitely more room to grow this year," McNeil said. The redesigned versions of GM's full-sized pickups, which began arriving at dealerships in June, helped retail deliveries of those vehicles rise 51 percent. About 15 percent of the sales were the 2014 versions, which are currently being produced only in the crew-cab model. 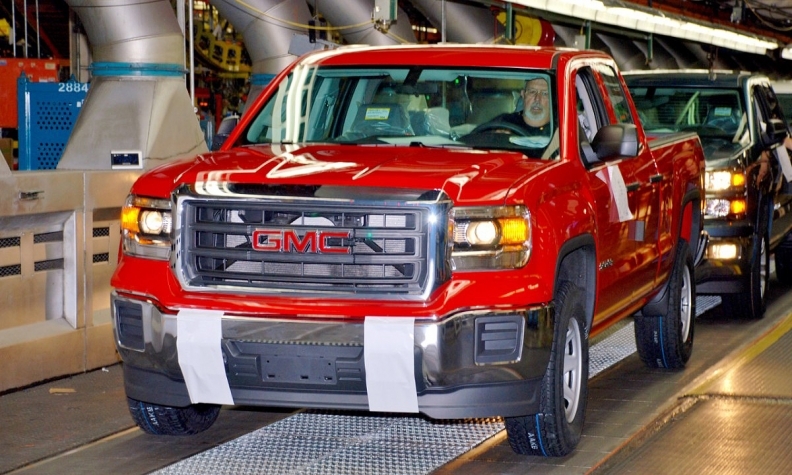 Full-sized pickup deliveries to small-business customers doubled, GM said. Sales of the GMC Sierra increased 49 percent to 16,582, and sales of the Chevrolet Silverado climbed 45 percent to 42,080. GM said it has 140,035 of the full-sized pickups in inventory, a 68-day supply. Car sales grew 24 percent, including a 42 percent jump in sales of mini, subcompact and compact cars. Sales of Chevrolet cars rose 31 percent. Sales of the Chevy Cruze surged 70 percent, with fleet deliveries accounting for most of the increase. Cruze retail sales increased 24 percent, GM said. GM has about a 50-day supply of the Cruze. Don Johnson, head of Chevy sales and service, said GM sold about 350 diesel-powered Cruzes in July, bringing the total to nearly 600 since the diesel option debuted. Sales of the tiny Chevy Spark rose 164 percent from a year ago, when it was new on the market. But two other Chevy nameplates that had been in high demand posted declines. Equinox deliveries fell 7 percent, and Sonic sales slipped 4 percent. Sales of the Chevy Impala rose 38 percent after the newly redesigned car reached dealerships. Johnson said 60 percent of those sales were to retail customers and 60 to 65 percent were the redesigned 2014 model that last week was named the top-scoring sedan on the market by Consumer Reports. At Buick, sales declined for three of the four models carried over from a year ago, with the Regal sedan dropping 34 percent. The Enclave SUV, up 14 percent, and the new Encore combined to account for roughly half of the brand's sales. Sales at Cadillac were relatively stable, except for the XTS and CTS sedans. The XTS, which debuted last year, jumped 69 percent; sales of the CTS, which has been redesigned for 2014, slid 39 percent. Nonetheless, McNeil said GM is content with the brand's performance. "We feel pretty good about the month for Cadillac," he said. GM estimated the industry's light-vehicle seasonally adjusted annualized rate for July to be 15.7 million and repeated its previous full-year sales forecast of 15 million to 15.5 million units.